You know you’re a teacher nerd when you get asked to attend a Doug Lemov training and it’s like you hit the jackpot. For those of you who have no idea who Doug Lemov is, let’s just say he’s a rockstar in teacher land. In fact, in some circles, my excitement could even be misconstrued as bragging, (imagine that, bragging about work training, but it’s true, Lemov is the guru of effective teaching). Lemov’s name caught my eye in a New York Times article about crafting effective teachers a few years ago, before I was even accepted to a teaching program. I thought I was ahead of the curve when I walked into my interview with it practically memorized. Little did I know, my entire teacher training program would be connected to Lemov’s book, Teach Like a Champion. Not to mention all the professional development meetings at my school to this day centered on his findings. 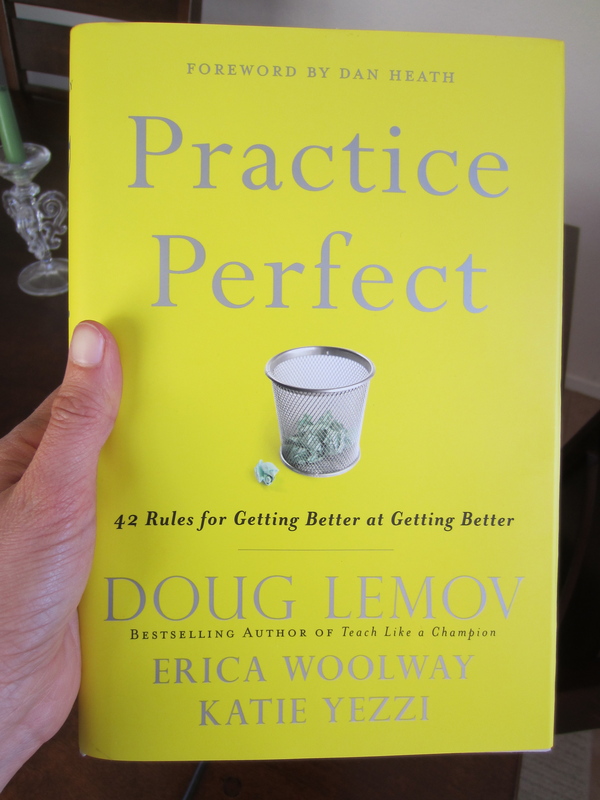 So, when I received an email this morning asking if I’d be willing to read his newest book, Practice Perfect, and attend a two day training down in the Bay, I enthusiastically said yes. That’s the thing, as hard as my job often feels, I am incredibly fortunate to work for an organization that is forward-thinking. Just last night, I sat in a restaurant with representatives from a non-profit whose sole aim is to perpetuate the teacher residency model as the most effective way to train new teachers. Inspired by the medical field, residencies puts trainees to work side-by-side in the same classrooms as highly effective mentor teachers full-time, for an entire year. Instead of the usual student teacher label, residents are called co-teachers and treated accordingly. The residency I participated in, which is also part of the organization I still work for, has proven to be one of the most successful in the nation. As I was interviewed about my second year in my own classroom, I was reminded of my passion for changing the way education looks in this country. I was also asked more than once about whether I got my strategies from Doug Lemov. I was happy to say yes. Proud to be a teacher nerd. I’m in a education masters program right now and we’ve been reading a ton of Lemov. He’s fantastic. The training session must have been powerful. Olivia, I just discovered Doug Lemov and you on the same day! And the fact that you are in Sacramento, well, that makes it even better. I am a teacher in the Sac area and would love to find out more about this workshop you went to in the Bay Area. I hope there are plans to expand Uncommon Schools, or something like that here. How can I find out more? Thanks. Hi Mary! Glad you discovered Lemov! I haven’t gone to the training yet, but I’ll be happy to share when I get back. Check out Aspire Public Schools in Sac– their practices are highly connected to Uncommon Schools and the organization has schools throughout California and is in the process of expanding to Memphis. I just googled your name and found you work for a charter inspired by Waldorf practices– that sounds amazing as well. I’ve considered Waldorf training further down the road. I’d love to hear more!